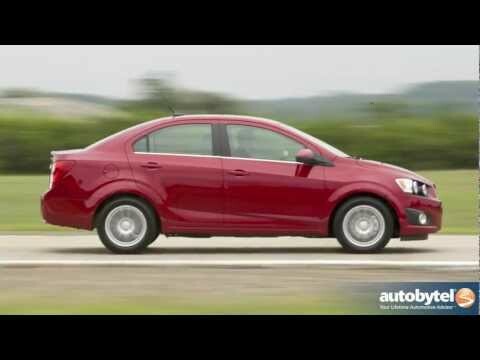 New for 2012, the Chevrolet Sonic has popped on the scene as a solid all-rounder that is fun, quiet and stylish without pushing the extremes of those descriptions. Competent, capable and built in America, the Sonic happily eclipses the underwhelming Chevy Aveo that preceded it. What's a Sonic?! And why I love it! I bought my sonic preowned from a Chevrolet dealership. I had never heard of a Sonic before. I was kind of off put by the vehicle at first but after taking it for a test drive I decided to purchase. My car has been through a house fire and was rear ended and totaled two years after purchasing. I bought back the car because it still was running and was only at 75,000 miles. The transmission was recalled by the dealership and taken care of. I keep up maintenance on my oil. The car has had very few problems, it recently needed a new starter and control arms. I have a issue where the automatic shifter won't give me my key when I turn of the vehicle unless I shake it. Overall the Sonic has been a wonderful car and I love it. It is getting to small for my family but I absolutely love it and would recommend it to anyone. it gets amazing gas mileage and has been a dependable vehicle. The good, the bad and the ugly of owning a sonic. The sonic has eaten tires. We have replaced the tires 5x in 170, 000 miles. The clutch was replaced. The turbo sensors are constantly needing attention. The air intake cover had to be replaced also. Other than that I love it. I love the fuel economy, the small size and ease of use. It is hard to get manuals serviced since the parts are not readily available. This is a Chevrolet problem since they do not stock them. So if you need something replaced and do not get serviced by the dealership, expect to wait. I love the hatch back also. It is very roomy for hauling things. We have an antique stall and haul things in the sonic all the time. And get 37 miles to the gallon consistently. I do not like the redesigned sonic and will most likely not buy it again. Our getaway car: it is very spacious with enough room for traveling. Love the sonic it is very comfortable, easy to get in an out of. Comfortable seating and adjustable seating. Air and heat works great! Heats and cools quickly. Trunk opens from the inside. Spacious trunk. We have never had problems with the sonic. Regular oil changes and air filters. Great gas mileage according to my husband. He bought the car with me in mind. We like to take time to get away when we can and it's a wonder! You don't really realize the car as it is smooth sailing. On the interstate or highway. It handles quick changes if necessary even in town. It's the best car we have ever owned and definitely consider buying another one next time. General Motors LLC (GM) is recalling certain model year 2012 Chevrolet Sonic vehicles manufactured from May 5, 2011, through February 24, 2012. These vehicles fail to conform to Federal Motor Vehicle Safety Standard No. 104, "Windshield Wiping and Washing Systems." The windshield wiper washer hose on these vehicles may separate from the washer fluid reservoir. If this occurs, washer fluid will not be available to the windshield. A lack of washer fluid could impede the driver's view, increasing the risk of a crash. GM will notify owners, and dealers will secure the windshield washer hose to prevent separation, free of charge. The safety recall is expected to begin on, or about, September 7, 2012. Owners may contact the Chevrolet owner center at 1-866-694-6546. General Motors LLC (GM) is recalling certain model year 2012 Chevrolet Sonic vehicles manufactured March 1, 2012, to June 29, 2012, and equipped with a 6 speed automatic transmission and 1.8L four cylinder engine. In the affected vehicles, the transmission turbine shaft may fracture. If the transmission turbine shaft fracture occurs during vehicle operation in first or second gear, the vehicle will not upshift to the third through sixth gears, limiting the vehicle's speed. If the fracture occurs during operation in third through sixth gear, the vehicle will coast until it slows enough to downshift to first or second gear, increasing the risk of a crash. GM will notify owners, and dealers will replace the transmission turbine shaft, free of charge. The manufacturer has not yet provided a notification schedule. Owners may contact Chevrolet customer service at 1-800-222-1020. GM's number for this recall is 14234.